Skip April 22, 2015 Conservation, FEATURE STORY, Slide 1 Comment on Conservation: Are baitfish the honeybees of the oceans? Bait at the Crossroads. To manage or not, and how? 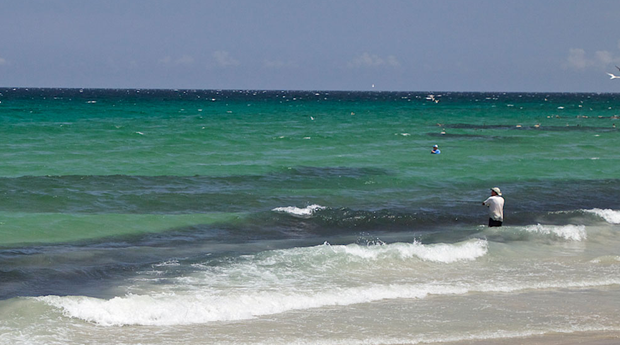 Huge schools of baitfish once blanketed the surf. Is what anglers are reporting just a hiatus? Pat Ford photo. Salt water baitfish may be on the decline, with no end in sight. So says a growing number of coastal anglers, who view the shortage as affecting their interests—not the least of them, tourism. Whether the problem is real is up for debate. But if proven correct, it could have far-reaching consequences. What does this mean to salt water fly fishers? Imitation is the goal of all angling with flies – including ethereal pursuits such as salmon and steelhead fishing. That’s why ample forage is an integral part of it. Mention salt water forage and most anglers think baitfish, which are typically associated with streamers and bucktails. But there’s much more to forage than white-knuckle hook-ups. Take, for example, how baitfish represent the primary link in an undersea food web that unites all marine creatures—from tiny invertebrates to mammals and birds? Talk about mouthfuls! So far, In Florida there’s no confirmation that the stocks are dwindling. Yet it has happened elsewhere and the mere mention of a shortfall has the experts clamoring. One thing’s for sure: There have been changes—some that we fly fishers are well-aware of. 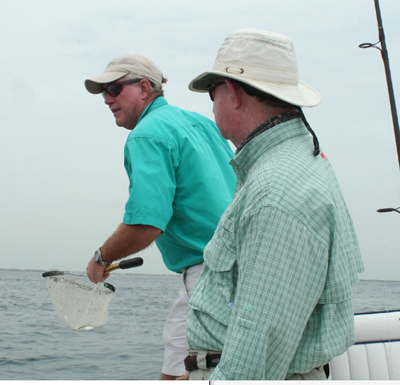 Take how, fly fishermen rely on live chumming–which, admittedly, amounts to a drop in the bucket. But, still, it speaks to the increased consumption of a finite resource. Add the very real threat posed by large commercial harvests (baitfish are now used for everything from fertilizer to cosmetics, to the pellet food that’s used in trout hatcheries) to a general decline in the quality of the environment, and you have all the ingredients for an eco-implosion. So, what can we do to avert disaster? Capt. Steve Anderson disperses live “chummies,” while Pat Ford waits to cast. Giant jack crevalles respond to a handful of baitfish. When I asked Grubich if he’d witnessed any recent trends, he mentioned the shift away from single-species management–the traditional way to manage fish stocks–to a more-holistic approach: ecosystem-based fisheries management. That’s where a wealth of factors are considered together: from the health of seagrasses and mangroves to overall water quality. 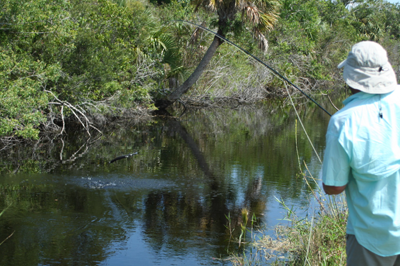 Fly fisher, Paul Nute puts one in the air in a “healthy” canal that also serves as a nursery. As for the International Game Fish Association (IGFA), it’s fully committed, as is the Florida Wildlife Federation, the Guy Harvey Foundation, Pew Charitable Trusts, the Snook and Game Fish Foundation, and other groups that favor a forage management policy – in this most-recent attempt to protect the environment. So, is there a problem and if so, is it fixable? While the debate continues—mired, albeit, by gaps in the data—both the Mid-Atlantic and Pacific Fishery Management Councils have taken action by curtailing the development of new forage fisheries. This has been lauded as a step in the right direction, but Florida has yet to take action. Yet, it could be one of the first states to do so and, arguably, has the most to lose if a forage fish collapse does occur. In fact, it was only recently that a coalition of stakeholders asked the FWC for enhanced forage fish data collection and management. Now, with Florida becoming our third-largest state (based on population), and with so much revenue hanging in the balance—not just commercial but recreational (i.e. tourism) —this call for action might turn the tide. 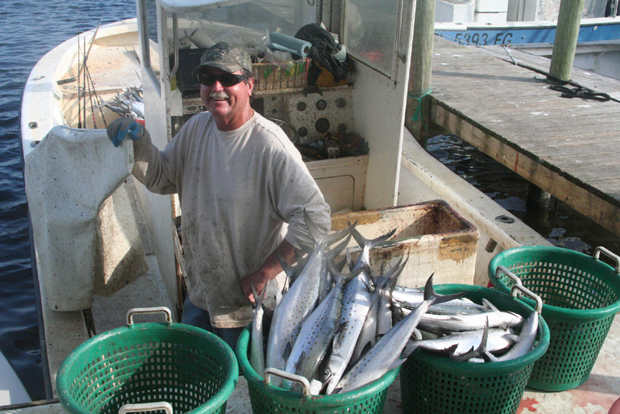 Commercial fisherman, Ben Hartig, with a catch of Spanish mackerel that stayed in his chum slick. Either restrictions or shortages, could affect his ability to earn a living. The menhaden population has not recovered throughout its historic range from Maine to Florida. Capt. 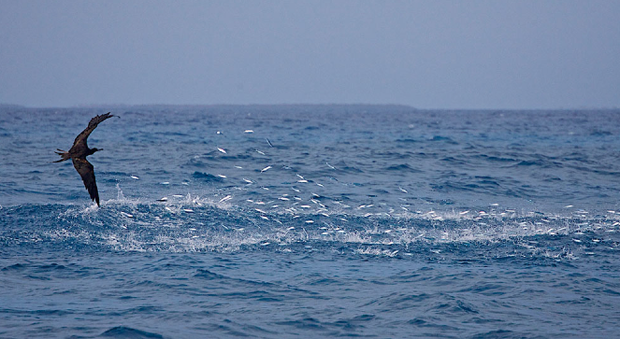 John McMurray explains the importance of forage fish . . . The sardine population along the West Coast has collapsed due to changing ocean conditions and other factors, including allegations of overfishing, prompting regulators Monday to cancel fishing next season and schedule a vote this week on an immediate emergency ban. Since 2007, the recorded drop in sardine population is 91%. Read story details . . .